SchoolEveryWhere is more than just another technology solution - it is an educational system that will improve the way school is managed. 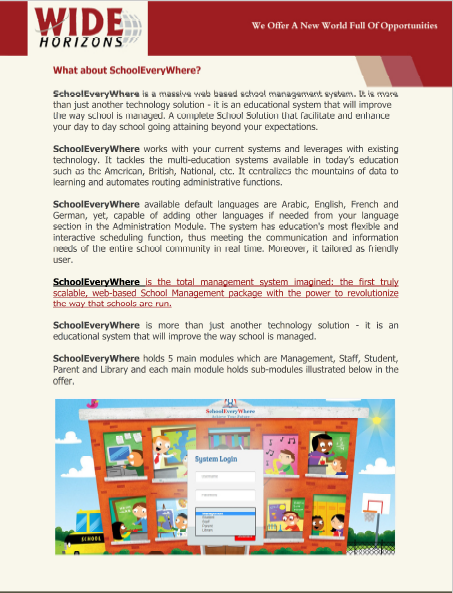 SchoolEveryWhere is a massive web based school management system. It is more than just another technology solution - it is an educational system that will improve the way school is managed. A complete School Solution that facilitate and enhance your day to day school going attaining beyond your expectations. SchoolEveryWhere works with your current systems and leverages with existing technology. It tackles the multi-education systems available in today’s education such as the American, British, National, etc. It centralizes the mountains of data to learning and automates routing administrative functions. SchoolEveryWhere available default languages are Arabic, English, French and German, yet, capable of adding other languages if needed from your language section in the Administration Module. The system has education's most flexible and interactive scheduling function, thus meeting the communication and information needs of the entire school community in real time. Moreover, it tailored as friendly user. SchoolEveryWhere is the total management system imagined: the first truly scalable, web-based School Management package with the power to revolutionize the way that schools are run. SchoolEveryWhere have been designed for customers who require value based solutions at low costs. SchoolEveryWhere has been designed after extensive study and research into the various aspect of hospital functionality. SchoolEveryWhere is designed to support all the major features required by a hospital and is designed with a modular architecture which allows a high level of scalability and flexibility for the end user. SchoolEveryWhere is deployed not only on secured private cloud but also available in dual mode with offline facility. We are offering this facility in those areas where the internet connectivity is not available. With SchoolEveryWhere your business wont stop even if the internet connection does. SchoolEveryWhere makes it easy to communicate with all of the stakeholders in the educational process: Administrator, Teachers, Students and parents. Teachers can easily access pertinent student information, generate reports, collaborate with other educators or develop lesson plans from virtually anywhere. Parents can view or be alerted to absences, grades assignments and school events. Students can receive assistance outside of the classroom. SchoolEveryWhere provides a single secure database structure that organizes stores and retrieves real-time information. It is very intuitive and uses industry-standard interface, that doesn't require a burdensome amount of staff training. All school data and scheduling information of any past academic year is instantly available and every program is accompanied with perfect security. Any data in the system can be analyzed, graphed and reported in the format of your choice. Administrators can effortlessly generate any type of report from their browser using SchoolEveryWhere. With SchoolEveryWhere, student functions such as admission, attendance, grading, discipline and family information are efficiently managed. Data is entered only once and instantly available in customizable reports. Imagine the possibilities! Data of your any student can be searched by just feeding in a Register Number. Just build your financial tree, and then start issuing your vouchers. All financial reports will be generated automatically till the balance sheet generation. Student’s financial history reported in the format of your choice. Financial department can effortlessly generate a financial report history of each student from day zero till graduation. Cash flow is made easy by automatic reporting through settled fees and payment dates. Educators can effortlessly view all accessible Student Records including parental information, emergency contacts, disciplinary records and more! Student photograph can be updated any time. A single click makes a student absent or present. It generates reports of every student's attendance reviewable at any time. Mark-sheets are generated electronically with comparison of marks of each exam. Even graphical representation is also generated. Fee vouchers are generated and fee collection program can be customized according to school's rules. SchoolEveryWhere is Fully designed coded and delivered by Wide Horizons.Wide Horizons is committed to delivering efficient and cost-effective solutions that enhance customer productivity and profitability. Wide Horizons provide a variety of IT Solutions which is proven to be the best among other competitors. After sales service, can take you to a new planet where people still deal with customer as their Boss. SchoolEveryWhere was just the tool we needed. It was simple to use and didn’t take our staff much time to get used to. I challenge everyone to forget about the bad experiences with other school ERP software and give SchoolEveryWhere a try. It will bring quality and efficiency to your school. We absolutely love SchoolEveryWhere and would not be able to run our school without it. This software is fantastic. SchoolEveryWhere is an all in one software. You have got everything in it. It manages attendance, gradebooks, fee collection and even HR. We love it. It’s so easy to use and comes with so many features. There is plenty you can do if you have SchoolEveryWhere running in your school. SchoolEveryWhere fits in really well with our school. We were using another software before but SchoolEveryWhere is way better. It covers almost everything. I can pull out any report and any data in just few clicks. SchoolEveryWhere has added a lot of value to our schools. I highly recommend it. It’s an amazing product. It is full of features and functionalities and comes with very good customer support. SchoolEveryWhere is a great way to communicate with students and parents. Making announcements and sharing progress reports with parents was never so easy.